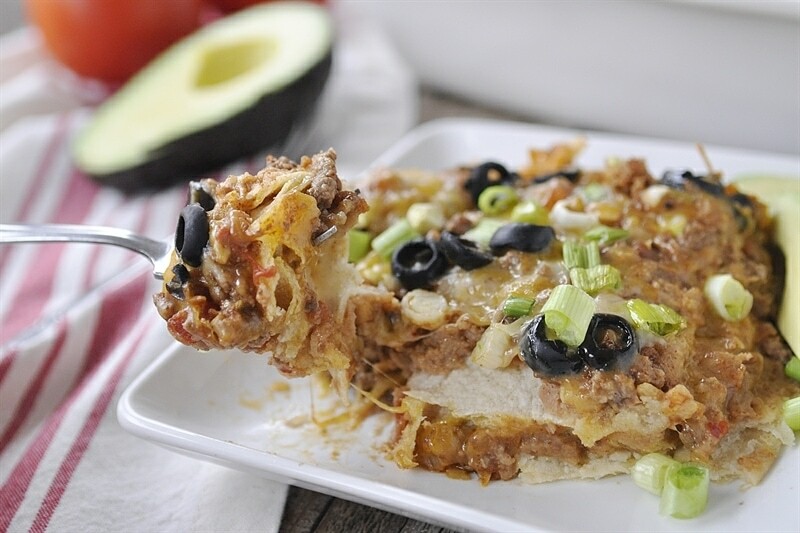 Mexican Lasagna is sure to be a hit with the whole family and a fun flavor twist on a classic dish. 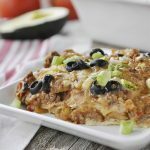 Lasagna is comfort food for a lot of people but I have to confess, I don’t make lasagna and I’m not sure I have ever made a lasagna from scratch, maybe once. If we have lasagna it usually comes from Costco. I find the whole process messy and time consuming. Now Mexican Lasgana is another story. Not only is this a fun flavor twist on the traditionally Italian dish but there are no noodles to boil which is huge for me. Instead of noodles this Mexican Lasgana uses corn tortillas and all my other favorite Mexican flavors and foods. Of course, feel free to use flour tortillas if you prefer. The process begins with a layer of tortillas covered with some refried beans. 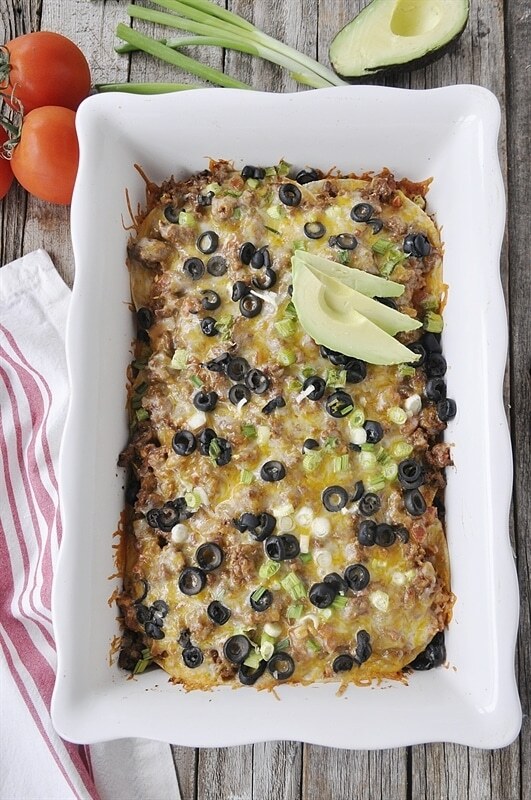 This is then topped with a meat mixture of hamburger, garlic, onion, taco seasoning and diced tomatoes with green chiles. On top of that layer is cheese and then you just repeat. On top of the final cheese layer I added sliced black olives and green onions. It then bakes for about 20-25 minutes or until it is heated through and the cheese is melted. 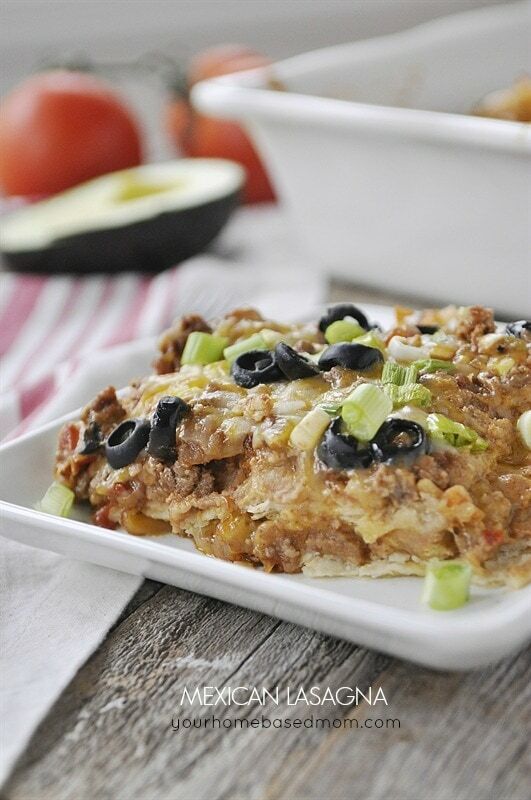 I love to serve this Mexican Lasagna with Mexican Rice and a green salad. It would also be good with some Lime Cilantro Rice. 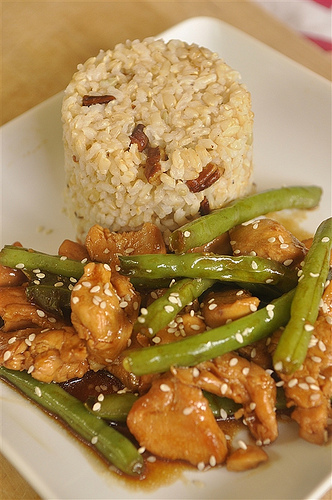 This dish is one of those that is pretty much guaranteed to become a family favorite. 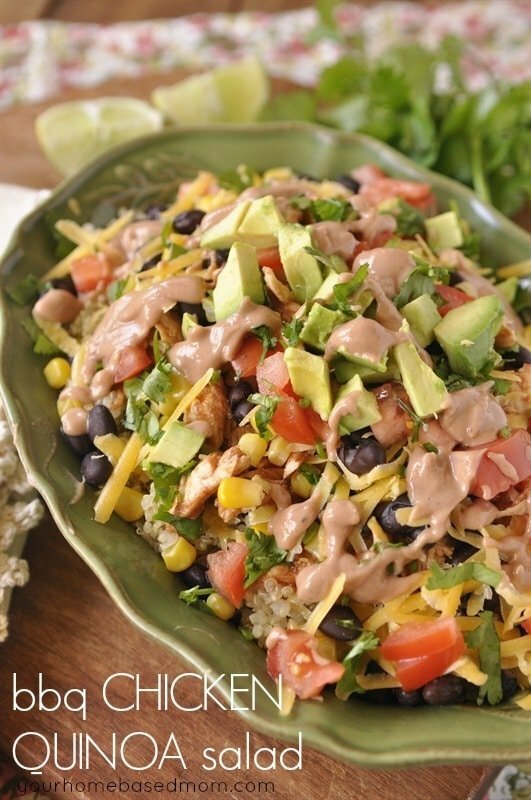 It also makes a great dish to take to a group event or potluck. People love it! In a large pan, brown hamburger along with onion and garlic. Stir in taco seasoning and canned tomatoes. Spray the bottom of a 9 x 13 pan and line with 6 corn tortillas, they will overlap. Spread half of refried beans over tortillas. Slightly warm beans to make them easier to spread. Cover with half of meat mixture and then half of cheese mixture. 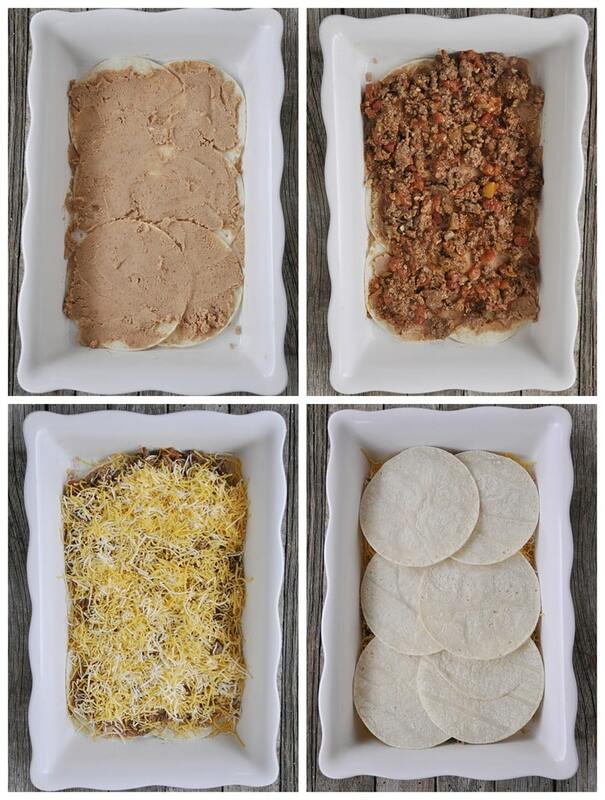 Repeat with remaining tortillas, beans, meat mixture and cheese. 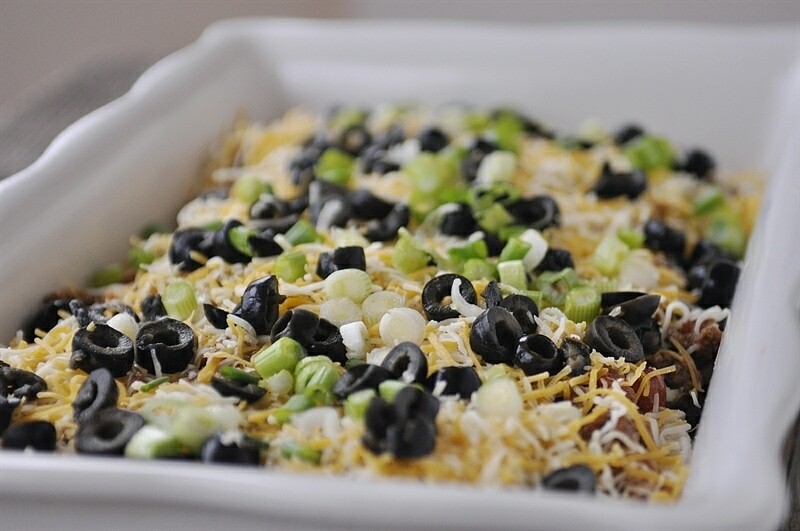 Top cheese layer with sliced black olives and green onions. Bake or 20-25 minutes or until heated through and cheese is melted. Thank you, Leigh Anne. I can’t wait to make this for my husband, who has celiac disease. 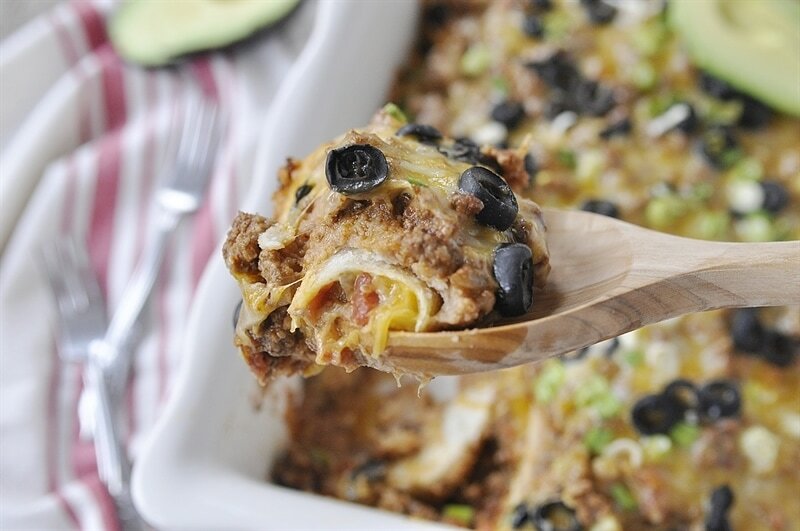 Just use Gluten Free Taco Seasoning and the casserole is gluten free. I am always excited to find new G/F recipes. I hope you both enjoy it!! I know exactly how it can feel to find a new G/F recipe, I remember those days when my daughter was at home and I was cooking for her. Sounds yummy. On the menu for tonight! I have made Italian lasagna from scratch for the last 56 years! The first time I ate lasagna was on our honeymoon driving from Illinois to Niagara Falls. One of my wedding gifts was a Better Homes and Garden cookbook with a lasagna recipe. 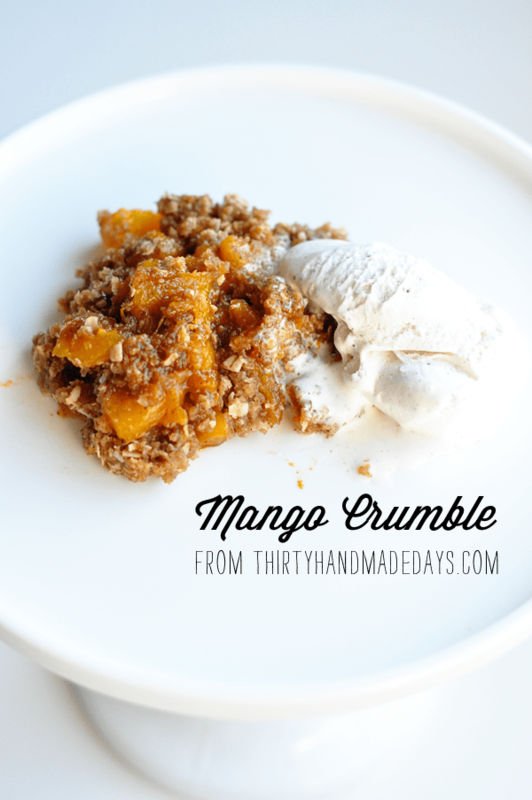 It an absolute must to learn to make our favorite honeymoon dish. Over the years it has been served to many guests and family. I have changed the original recipe a little. Pat, I love your story and I bet your lasagna is amazing! I used to make something like this years ago, and we loved it. Sadly, I lost the recipe and somehow forgot about it. 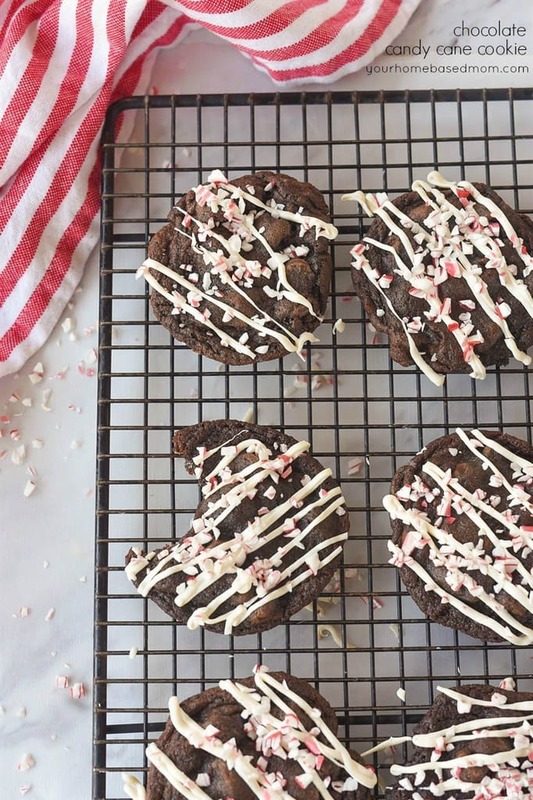 I will definitely be giving this a try at our house very soon. I make homemade lasagna ALL the time. It is seriously one of my quick “go to” meals if we have unexpected company coming. I gave up boiling the noodles years ago. I put sauce in the bottom of the pan, make my lasagna layers with plain old lasagna noodles, and then pour about a 1/2 cup water (or spaghettii sauce thinned with water) over the top before covering with aluminum foil. Bake for an hour on 350 and the noodles turn out perfectly. No mess. No burned fingers. No hassle. Laure, Great tip on the lasagna noodles as boiling them is my least favorite part! Will have to try it. I made this a little while ago, and am feasting on it now. Aye caramba! So good! I topped it with a little La Costeña Mexican green salsa Medium for a little heat. My husband loves it too. Seconds will be topped with Herdez Roasted Salsa Roma. Thank you Leigh Anne for such an easy, tasty lasagna. No pasta pot to wash! Will serve for company. Love hearing that! Your additions sound like perfection! Thanks for letting me know.